OK, here is the deal….you shove it all in a pretty box, close the box, put it out somewhere as a decoration, and wa-la! 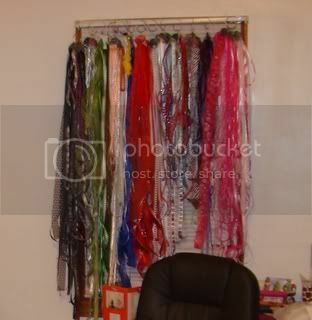 There is your ribbon storage! Ok, so the box is a little messy, but how fun is it to just run your fingers through your entire ribbon stash when looking for one 5 inch piece of purple ribbon? 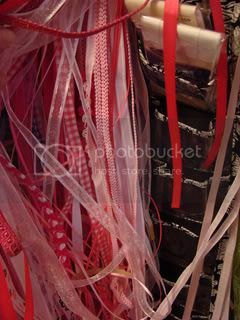 And since it has a lid on it, no one can see how messy your ribbon is (or how much you have!)! I am still figuring it all out. 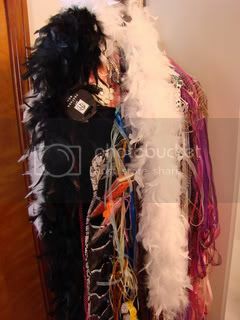 Seems I spend so much more time “organizing” than I do scraftin’ these days..haha! Janice..you know..that is sort of what I have been doing up until now….well except for the “pretty” part of the box. I do like being able to run my fingers through…and seeing all the colors in one place. 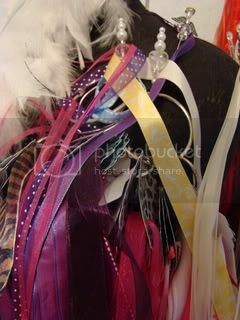 Makes it easy to take the ribbon to my project or my project to the ribbon to match colors/hues. I stayed up very late last night working on a possible solution, so we shall see, right? 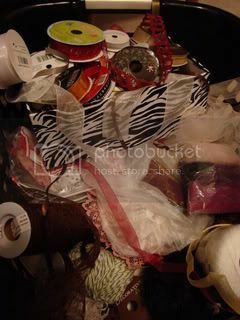 I currently have my ribbon on the big wood organizers but I just got the ribbon ring and plan on moving all my ribbon to those so I can have it where ever I need it. And it will take a lot less space on my wall. You could hang them behind a door. 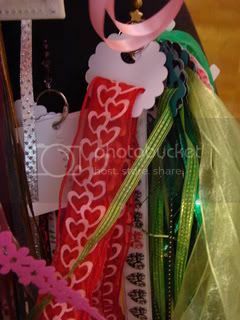 If you have a lot of certain ribbon I would say cut off a yard and hand that and put away the rest. Just mark how much more you have on the tag holding the ribbon. reels to make my rings. 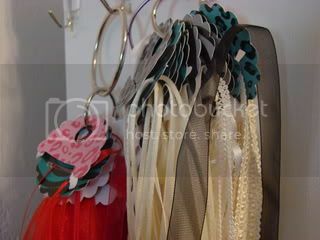 I organized them by colors and then tied one ribbon near the top to prevent them from slipping offf the ring. Now here is the great part, I found a bakers rack for $30 at a garage sale and it has hooks so I just hooked each ring onto a hook. I can see at a glance which colors I am grabbing and I keep the actual ribbon yardage tucked behind it so it doesn’t take up the space on top of the bakers rack. I just recently started placing all of mine on small cards that fit into my rubbermaid drawers. Will have to see if I like it or not.